4th St. at Spruce St. The speed limit on the majority of streets in the St. Louis CBD is 25 mph. 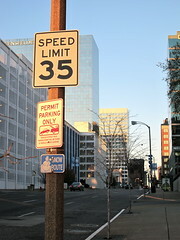 Outside the CBD, but still within downtown, speed limits are commonly set at 30 mph. Some of the arterial roads through downtown, however, have 35 mph speed limits despite crossing major pedestrian corridors. Pedestrian safety, it seems, plays second fiddle to making sure vehicles get from one side of downtown to the other as quickly as possible. More and more cities have begun promoting 20 mph speed limits to improve pedestrian safety, and for good reason. According to the UK Department for Transport, if a driver hits a pedestrian at 30 miles per hour, the victim only has a 55 percent chance of surviving. At 20 mph, the pedestrian has a 95 percent chance of survival. Tucker and 14th St both cross Washington Ave, downtown St. Louis’ premiere street and busiest pedestrian corridor. On the southern end of downtown, 14th St also passes the Civic Center transit hub where MetroLink and MetroBus riders frequently cross the street to access jobs, connecting buses, and events at Scottrade Center. But perhaps most baffling of all are Memorial Drive and 4th St. Thousands of tourists cross these two streets every year to access the Arch and Old Courthouse. Improved sidewalks to cross Memorial Drive and the I-70 trench were only just completed last year. Yet, the speed and volume of traffic on these streets still scream danger. The 35 mph speed limits on these streets are unacceptable. For comparison purposes, the 3-5 lane streets on either side of Fort Washington Way in downtown Cincinnati—very similar to I-70 and Memorial Drive, here—have 25 mph speed limits. Amazingly, the long highway ramp connecting Pine St. to I-64 has a lower speed limit (30 mph) than any of the downtown St. Louis streets listed above. And that's just the posted speed limit. It's a safe bet that many of these streets have operating speeds of 5 to 10 miles over the speed limit.